For more than two decades, I’ve been covering the Southern Cone countries of Argentina, Chile, Uruguay and the Falkland Islands for various guidebook publishers. Because the seasons are reversed from my Northern California home, I’ve arguably experienced an endless summer – as a rule of thumb, I leave the Northern Hemisphere when the World Series ends and return in time for opening day. In South America, though, I’ve generally missed the presence of baseball, my favorite participant and spectator sport. It hasn’t been a total loss. I’ve played both softball and baseball in Buenos Aires (where there’s a pretty good recreational league that includes teams of Cubans, Japanese and Koreans, as well as Argentines). In the Falklands, I surprised some Japanese fishermen by joining them in a game and catch and throwing curveballs – something they expected even less than somebody who could catch the ball. In Paraguay, I watched a sandlot pickup game (pictured above) in which most of the players were ethnically Japanese. Venezuela, of course is South America’s baseball powerhouse, contributing many players to the major leagues though the economic crisis there has brought hard times to the game. Colombia is a distant second, but there’s an up-and-coming entrant – as of just a few days ago, Brazil can boast its first player ever in the World Series, reserve outfielder Paulo Orlando of the Kansas City Royals. At the age of 29 Orlando, who started playing with Japanese-Brazilians in his home town of São Paulo, is a late bloomer who played more than a thousand minor league games before finally reaching the majors this year. Seen above hitting a game-winning home run in July, he played in 86 games and showed speed and some power, with 14 doubles, six triples and seven homers. Orlando hasn’t played much in this Series against the New York Mets, though, and he’s not even the highest profile Brazilian in the game. Catcher Yan Gomes, of the Cleveland Indians, plays the game’s most demanding position and, though he spent considerable time on the disabled list this year, the 27-year-old is just entering his prime (Gomes also spent much of his youth in Florida). São Paulo native Andre Rienzo, a righthanded pitcher for the Miami Marlins, has had limited success so far but is also only 27. According to Gomes, baseball “is such a growing sport (in Brazil) right now, it’s amazing.” Whether Brazilian baseball will ever really take off in a country that’s obsessed with futebol (soccer) is open to question, but these three major leaguers demonstrate that the athletic talent is there to play this complex and difficult sport. Recently, a friend returned from Argentina with roughly 1000 worthless pesos – worthless in the US, at least, but he had bought them with “blue dollars” and still came out ahead on his traveling costs there. Since he knew I would be traveling south soon, he offered them to me as a gift, as I had advised him on the arcane details of changing money there, but I paid him US$50 for the bunch – about 20 pesos per dollar as opposed to 16 pesos on the informal market in Argentina and 9.50 pesos at the official rate. It’s a relatively small amount, but will still come in handy the first time I cross the border (I’ll be visiting Chile first). In Spanish, peso means “weight” and, in many Spanish-speaking countries, it’s also the unit of currency (roughly analogous to “pound” in the British English). 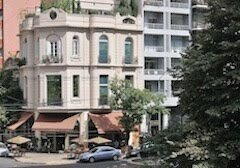 Frequently, on this blog, I’ve pointed out problems with Argentine money – especially the inconvenience of carrying large piles of banknotes when the highest denomination is 100 pesos (about US$6 at the informal rate, barely US$10 at the official rate). Argentina’s outgoing government – the first-round presidential election takes place this Sunday – has resisted issuing larger banknotes, probably because it would draw attention to the country’s high inflation rates (as if rising consumer prices and the bulging wallets do not). This, I might argue, is an issue of weight. That said, I’ve written primarily about micro-issues that affect visitors, but a recent article in the Buenos Aires daily La Nación points out other practical macro-issues in Argentina’s currency conundrum. In that article, one economist observes that the cost of printing any individual banknote is the same; thus, it’s a truism that it costs more to print 10 hundred-peso notes than it does two five-hundred-peso notes or one thousand-peso note. For banks, it also costs more to count and transport larger numbers of notes, and more wear-and-tear on ATM machines that need to be refilled constantly (foreign visitors, of course, should use ATMs only in an emergency, since they pay the disadvantageous official rate). In any event, by Sunday evening, we should have some idea as to whether Argentines have chosen continuity – in the person of the official Peronist candidate Daniel Scioli – to replace outgoing president Cristina Fernández de Kirchner. He’s almost certain to garner a plurality, but it remains to be seen if he’ll be avoid a runoff against the more conservative Buenos Aires mayor Mauricio Macri. Whoever wins will have bigger issues to deal with, but even Scioli has indicated a willingness to embrace “gradualism,” to move away from the dogmatism of the Fernández de Kirchner years. In the longer run, that will have to mean resolving the exchange disparity and major economic issues, but simply printing larger-denomination banknotes would quickly redress an everyday inconvenience. I enjoy listening to tango music even if, for me, the dance itself is a spectator sport. 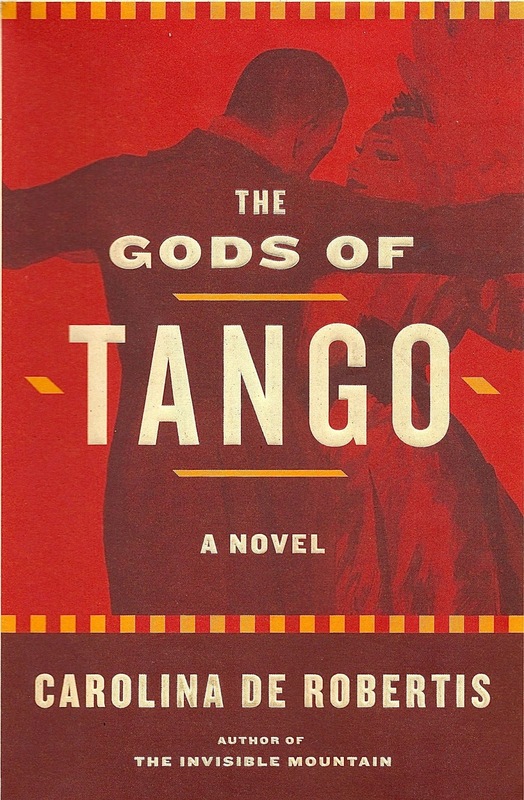 I also enjoy reading about tango’s origins, and the trajectory it took from the slums of Buenos Aires to Parisians salons, whence it returned with a veneer of respectability. Today, it’s often about Vegas-style floorshows, with skilled musicians and dancers, that pay superficial homage to its origins, while participatory milongas preserve something of the past. There’s nothing quite so gritty today, though, as there was a century ago. Novelist Carolina de Robertis, a fellow Oakland resident who’s also an acquaintance of mine, addresses those complexities in her recent effort The Gods of Tango (in the coming months, I plan to publish most of an interview I did with her in preparing a short article on Uruguay for a national magazine, but confidentiality prevents disclosing more details at present). De Robertis is a true cosmopolite, born to Uruguayan parents in the United Kingdom but long resident in the United States. She has three passports and, with Buenos Aires family connections, would probably qualify for a fourth. The Gods of Tango starts with the immigrant experience – or rather with the pre-immigrant experience, since her youthful Italian protagonist heads for the Americas to be united with her husband (also her cousin) in a proxy marriage. When Leda arrives in Buenos Aires, though, she learns that her Dante has died in a political protest and, ambivalent about returning to her dysfunctional Italian family, she decides to remain in Argentina. 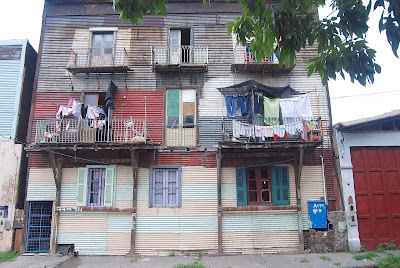 In the process, running out of money, she becomes a seamstress, living in the tenement room her husband had rented, but her wages are insufficient to remain there. The depiction of life in the immigrant barrio of La Boca (pictured above, in the not too distant past), where she discovers the allure of tango and begins to play the family violin she brought, inspires her to make it her vocation – despite the musicians’ overwhelmingly macho subculture. She leaves her original tenement, cuts her hair, wears Dante’s clothing, and even adopts his identity – moving to a San Telmo tenement where she is literally closeted. De Robertis’s depiction of the extremes to which Dante must go to protect this new identity offer eloquent insights into everyone’s living conditions – not just those of one unique individual. Recruited to a tango orchestra, Dante manages to fool everyone, including more than one woman with whom she/he becomes sexually involved. That may sound preposterous, but there is precedent – in the US, Billy Tipton – born Dorothy Lucille Tipton – passed decades as a male jazz pianist in the western states. Leda, though, can’t avoid the intrigues and violence that are part of the early tango scene and, eventually, has to flee for his/her life – but manages to keep the secret. Saying more than that would be a spoiler but, in the end, this apparently improbable novel tells us that many contemporary issues are not so new as we might have imagined – but it does so without indulging in anachronistic projections.